Place baking cups in muffin pans; set aside. Prepare cake mix following package directions for 24 cupcakes. Spoon batter into baking cups and bake as directed; cool completely. Tint frosting with orange food coloring; frost cupcakes. Sprinkle with Halloween decorator sprinkles, if desired. Melt white chocolate chips following package directions. Add shortening; stir until melted. Spoon melted morsels into ghost shapes on a cookie sheet lined with wax paper. Use mini chocolate chips or black gel for eyes. Let rest until ghost shapes have hardened and set. 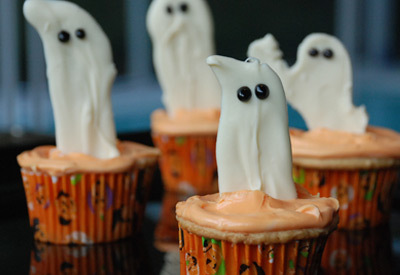 Stand one ghost in center of each cupcake.